Hi, hello, everyone! Megan here filling in for the lovely Anne for a few episodes while she deals with school. This week was something else, so let’s get down to the recap! It’s three years from now and Damon is visiting Alaric. He’s asking if he’s heard from his fiancée recently and he said, “she doesn’t like to answer the phone before broadcast.” (Wait, did we just learn that Caroline’s mystery fiancé from two episodes ago is ALARIC? How did that happen? And seriously, who is hunting them now?) Anyway, the two hear Caroline’s voice in the background and see that she is sitting at the broadcast station, blood streaming down her face as she says that she has a special message for Stefan Salvatore. Back in the 1800s, Stefan is teaching a younger boy how to load and shoot a gun deep in the woods of Mystic Falls — his son Jacob. As they walk through the woods, Stefan turns around and sees that the boy’s gone. Sadly, it was just a dream, and Stefan wakes up in the present day to Caroline asking who Jacob was. 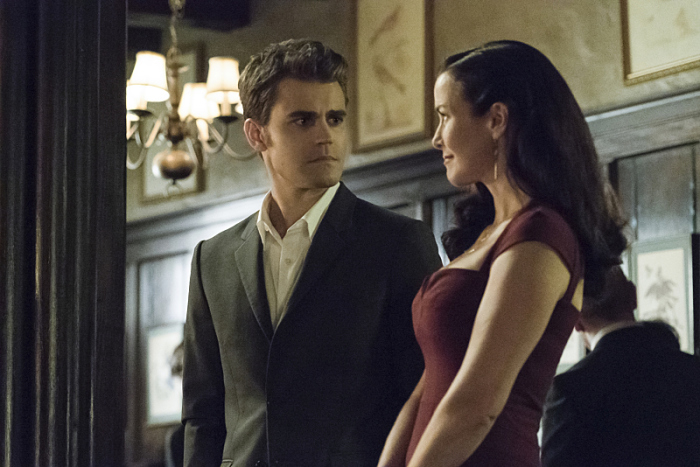 Clearly, Stefan is having a hard time dealing with the fact that Valerie was pregnant before Julian intervened. Caroline is surprised to see that Valerie is at the house and asks Stefan to explain. He gives her a vague lie that the whip-smart Caroline knows is masking a secret. Stefan asks her to trust him and instead of investigating further, she decides to drop it. Valerie tells them that they need to get a move on as Julian has been in that stone for 100 years, which likely drove him mad. Now reunited with his body, Julian dotes on Lily. She is blinded by her love for him and has now banned the use of Valerie’s name altogether. She reminds him that they have enemies, her sons, and Julian is surprised to know they’re alive. Beau delivers an invitation to the Salvatore brothers inviting them to a welcoming party for Julian. Sounds fishy. Remember when Esther returned way back when and had a party for her original vampire kids and that ended super badly? Or really, this could pretty much apply to any party that has ever happened in Mystic Falls. Guys, don’t go. As Alaric sits watching his wedding video, Bonnie calls to tell him that Faux Jo is in need of a babysitter and he can’t expect her to keep watch over her just because his plan didn’t work out. Stefan, meanwhile, is putting on a suit and wondering why Damon isn’t getting ready. Damon tells him he won’t be attending. I mean, would you attend the party of the woman who was the catalyst for the woman you love being in a magical coma until your best friend dies several decades from now? No, and neither would Damon. He divulges his plan to allow Lily to become blissfully happy only so he can rip it away from her. Saucy Stefan is here, guys. Caroline is trying to help Valerie find a place to run away to. This scene between the two is why I love Candace Accola on this show. She gives Caroline a bubbly jealousy that is so transparent but also so endearing. Valerie assumes that Caroline knows why she’s so afraid of Julian and is surprised to learn Stefan had kept his promise and the secret. Instead of telling her, Valerie lets Caroline think about it. Nora. meanwhile, is helping Julian adjust to the century of change. He says that this era suits her but she complains that the tight leash Lily keeps them all on is suffocating. He offers to talk to Lily and see if things can be tweaked. Mary-Louise asks if Nora will help her greet their guests and Nora insults her. I can definitely feel some sort of tension brewing between the two of them and I want to see how it pans out. I feel like it’s going to end poorly, but I’m excited nonetheless. Lily explains to Stefan once he arrives that the guests were from neighboring towns. She wants to prove that they’re in no danger and that her family is civilized. I mean, there’s a whole lot of evidence that goes against that, but okay. Damon shows up and asks Stefan to reconsider with a super fun furniture analogy. When he asks why Stefan is in such a hurry, he chooses not to tell him that Julian is the reason that he’s not a father. Eventually that’s going to come out and is going to also end poorly. Matt, lacking all kindness, waltzes in and asks why they stay when there aren’t any people to feed on. Mary-Louise comes up to them in a different dress and makes a joke about feeding on their guests that both Matt and Nora find in poor taste. Seriously, that powder keg can’t be far from an explosion. Bonnie and Enzo (another couple I seriously can’t figure out three years down the line) show up and Bonnie insults Lily. To be fair, she totally deserved that. Stefan and Julian are playing pool when Damon comes in and tells a story that is more for Stefan’s benefit than anyone else’s — a story of one being incredibly stupid. Julian is less than impressed and it shows. Meanwhile, Alaric finds Faux Jo peeping through WebMD to try and figure out what’s going on in her head. It seems that Alaric is somehow smitten with this new form and that seems like a terrible idea. A former student comes up and, as they’re talking, Faux Jo’s nose starts to bleed and she coughs blood. Is that what happens to anyone that moonstone 2.0 — sorry, the phoenix stone — brings back? Or is it just a side effect of not being placed into the body your soul was originally in? Lily gives a speech about the return of Julian and yammers on and on about a peace, unity, and love that we all know is simply unrealistic, as evident by Julian telling Beau that his time away had messed with his head. What would bring him relief was in Oscar’s possession but was not on him at his time of death. He hopes Beau can find it in his car. Of course, Enzo overhears this. Julian sees him and introduces himself, assuming Enzo is a member of the staff. How rude. Alaric calls Caroline for help. She offers Faux Jo her blood, which she immediately throws up. Valerie explains that the phoenix stone can only place a vampire soul back into a vampire body — that a human body is not fit to host a vampire soul. Caroline explains to her that she lacks all tact and should basically learn to think before speaking. Mary-Louise complains to Julian that she is mad at Nora. A server comes down the stairs and Julian compels her to stand still. He suggests drinking her blood but Mary-Louise reminds him that Lily forbade feeding on the guests. Julian starts to show how terrible he is by egging her on and getting her to drink the server’s blood. I already don’t like this dude. Another server comes up to Bonnie repeatedly asking where the high school is. Suspicious. Matt asks who it was and she suggests that they follow him. His phone dings and he tells her to meet him at the car. Stefan and Damon are still fighting about killing Julian. He knows something is going on that Stefan isn’t telling him. Matt, who was sober six seconds ago, is stumbling in with a bottle. Damon grabs the bottle, takes a drink and starts to sizzle. Oh, Stefan, you clever boy. Stefan goes downstairs and shoves a stake through Julian’s stomach. Lily walks in as Stefan throws him into the fire. Well, that didn’t work. Lily assumes that he’s attacking Julian out of spite — that he wants to take all of her happiness away. That seems interesting coming from the woman who keeps taking everyone else’s happiness away, but when you’re delusional, I guess you’re really delusional. Damon comes in and tries to make an exit with Stefan but Julian isn’t having that. He gives a speech about having to keep his head in his personal hell and a fight breaks out. Talk to me again about that peace, Lily. Alaric is saying goodbye to Faux Jo (whose real name is Florence) and it’s seriously emotional. (Like, can we just cool it on what you’re putting Alaric through, writer’s room? It’s not fair.) He’s happy to have heard her voice again and get the chance to finally say goodbye. Faux Jo whispers “goodbye, Rick” and it seems like this is the point in which Caroline starts to develop a soft spot for him. Bonnie and Matt are walking through the halls of the high school when creepy waiter boy strolls up with an IV. He seems unable to hear them and continues walking into a classroom full of people who are all seemingly in a trance. I’m going to go out on a limb here and assume that this is directly related to Julian. Valerie, elsewhere, is watching the end of Alaric and Jo’s wedding video. Caroline tells her to turn it off, but Valerie stops her. She recognized the chant in the video. Kai thought that they were sending him to another prison world, but they were protecting the future of the Gemini coven. She thinks that Alaric’s children may still be alive. Okay, plot twist. Damon is livid with Stefan. He knows that something is up because Stefan wouldn’t be acting like this otherwise. This is more of his type of thing. So Damon resorts to taunting Stefan into telling him what is really going on, and it works. He breaks down and tells Damon about Valerie’s pregnancy and Julian’s role in ending it. Stefan won’t rest until Julian is punished for what he ripped away from him. Valerie explains that the Gemini coven is always trying to preserve their lineage. The spell that they used was rare but effective. She asks for Alaric's blood and explains that if they’re alive, the blood will travel along the map until it ignites over their location. Stefan and Damon get extra mushy and discuss how sad it is that they can’t have families of their own. Stefan says that he’s done everything — seen every continent in the world but he still can’t have what he wanted most; a child. Damon offers to help him bring down Julian whenever Stefan says the word. That’s the type of bro code I’m down with. Lily questions Julian’s behavior and believes that it was still all about her. How vain. Get a grip, lady. The party was to promote peace, not create more tension. Julian wonders where the woman he fell in love with is. She doesn’t want to see her children dead and will not be happy if he messes with that. Madman over here explains that he might have gone a little batty being kept inside of a rock for 100 years and Lily asks him to promise that this type of behavior will never surface again. He agrees, but we all know he’s totally lying. Julian knows he needs protection and Lily agrees saying that it will require every member of the family. Back at Whitmore, the blood continues to travel along the map until it drips off. The floor and table ignites. Valerie doesn’t seem to understand how that’s possible and Caroline isn’t buying any of it. The babies are alive... and they’re alive inside of Caroline. Okay, maybe the idea of Caroline and Alaric being together isn’t as weird now. ... No, wait, it’s still super weird. Remember when things were so much simpler? When all we were worried about was the moonstone and Klaus trying to make hybrids and like... Katherine? I would honestly take Katherine at this point because the stuff being presented in The Vampire Diaries now is just wild. Poor Caroline. Every time she turns around, her life is taking a turn that no amount of planning could have prepared her to face. Maybe the writer’s room is taking pity on both her and Alaric and putting them together in order to force all of these dark clouds find someone else to rain on? I don’t know, but this is just plot twist after plot twist. What are you doing to us, Julie Plec? WHAT. ARE. YOU. DOING? Pray for more answers next week, guys. I’ll see you then.